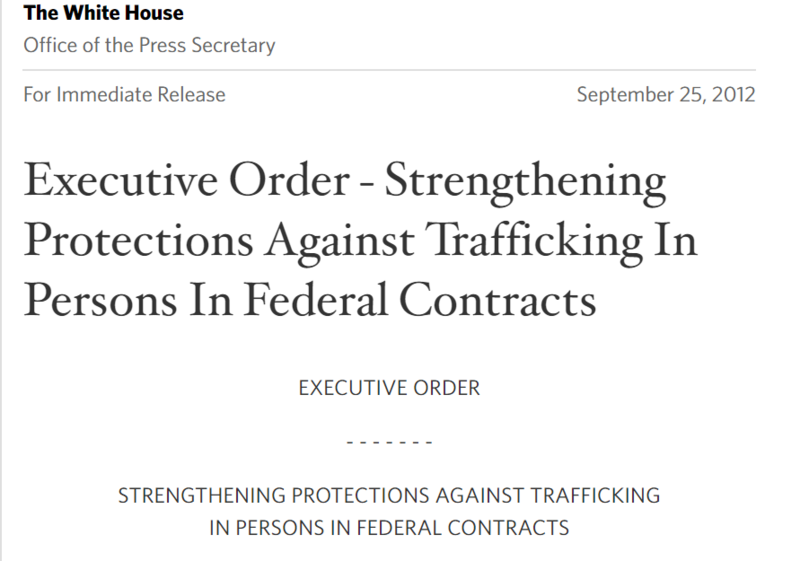 string(1248) "Resource Centre > Uncategorized > Executive Order – Strengthening Protections Against Trafficking In Persons In Federal Contracts"
The United States has long had a zero-tolerance policy regarding Government employees and contractor personnel engaging in any form of human trafficking. As the largest single purchaser of goods and services in the world, the United States Government bears a responsibility to ensure that taxpayer dollars do not contribute to trafficking in persons. By providing our Government workforce with additional tools and training to apply and enforce existing policy, and by providing additional clarity to Government contractors and subcontractors on the steps necessary to fully comply with that policy, this order will help to protect vulnerable individuals as contractors and subcontractors perform vital services and manufacture the goods procured by the United States.